Did you ever wonder about D.C.’s extraordinary street layout? It all began during Thomas Jefferson’s term as American ambassador to France (1785-1789). His interest in the arts and architecture made him travel extensively throughout France, Northern Italy and Germany. It was then that he also visited Karlsruhe, the northern gateway to the Black Forest. He was impressed with the fan-shaped layout of the city with all the main streets radiating from the baroque palace, which had been built some 70 years earlier. 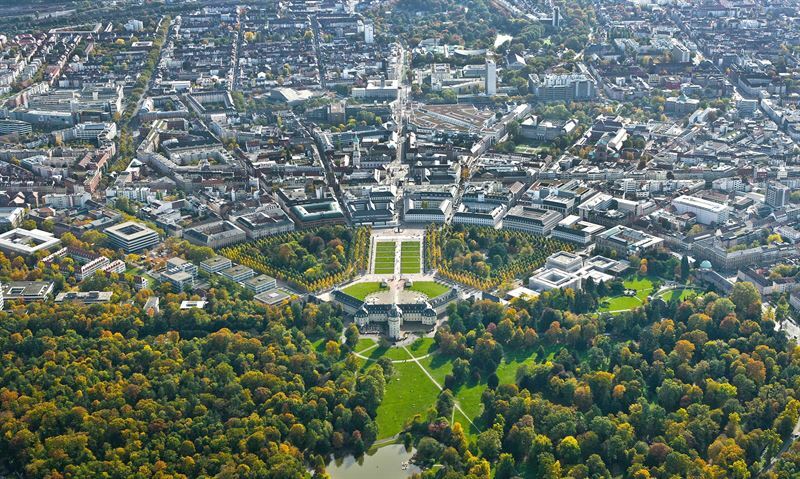 As a matter of fact, Karlsruhe impressed Thomas Jefferson so much that he sent a sketch of the city’s layout to Pierre L’Enfant, a French-born architect who had served on General George Washington’s staff at Valley Forge. It was in 1791, when then President George Washington appointed him to plan the new capital, that he used Thomas Jefferson’s sketch of Karlsruhe as inspiration for the design of Washington, D.C. So what about Karlsruhe? The 300-year-old city on the northern rim of the Black Forest in SouthWest Germany invites travelers to follow in Thomas Jefferson’s footsteps. With the baroque palace and its botanical garden at the city’s center, more than 2,500 acres of parks and green spots, and world-renowned museums, the city with a population of 300,000 is the perfect base for exploring the Black Forest and many other exciting places in that part of Germany. A mere hour by high-speed train directly from Frankfurt Airport, Karlsruhe’s palace tower awaits visitors with its amazing view of the city. Just beneath it, the palace’s botanical garden invites them to travel back in time and take a stroll where the margraves, prince-electors and grand dukes of Baden once lived. Culture lovers will fall in love with the city. In addition to the Center for Art and Media (ZKM), which is unique worldwide, Karlsruhe regularly hosts great exhibitions of international relevance: visitors can enjoy a great exhibition of the works of Paul Cézanne, comprising first-class loans from international collections all over the world, at the Staatliche Kunsthalle (The State Art Gallery) from October 28 to February 2, for instance.